Evolutionary biologist John Nyakatura at Humboldt University in Berlin has spent years studying a 290-million-year-old fossil dug up in central Germany's Bromacker quarry in 2000. The four-legged plant-eater lived before the dinosaurs and fascinates scientists "because of its position on the tree of life," said Nyakatura. Researchers believe the creature is a "stem amniote"—an early land-dwelling animal that later evolved into modern mammals, birds and reptiles. The researchers built a life-size replica of the prehistoric beast—"we carefully modeled each and every bone," said Nyakatura—and then tested the motion in various ways that would lead its gait to match the ancient tracks, ruling out combinations that were not anatomically possible. Agree. More impressive yet, how they managed to get a video from -290M years to compare. Time travel, I assume; I must have been on vacation and missed the news about time traveling confuser scientists. But the electro-mechanical contraption matches the documentary one to one. Bravo! 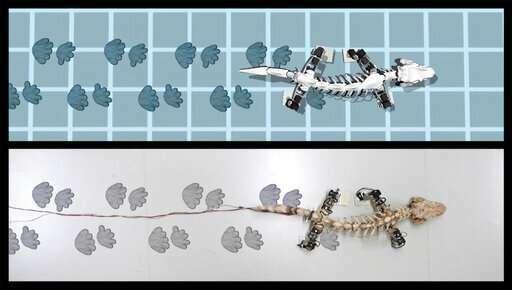 NoStrings, they used the known fossil skeleton to match the known fossilized footprints with a gate that matches it anatomical properties. 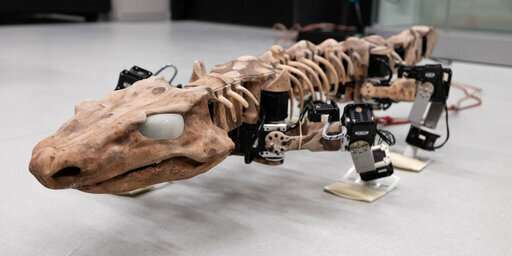 If you believe you can create a more accurate fossil that more accurately matches its fossilized gate, then please do! Or do you not have the necessary scientific background?